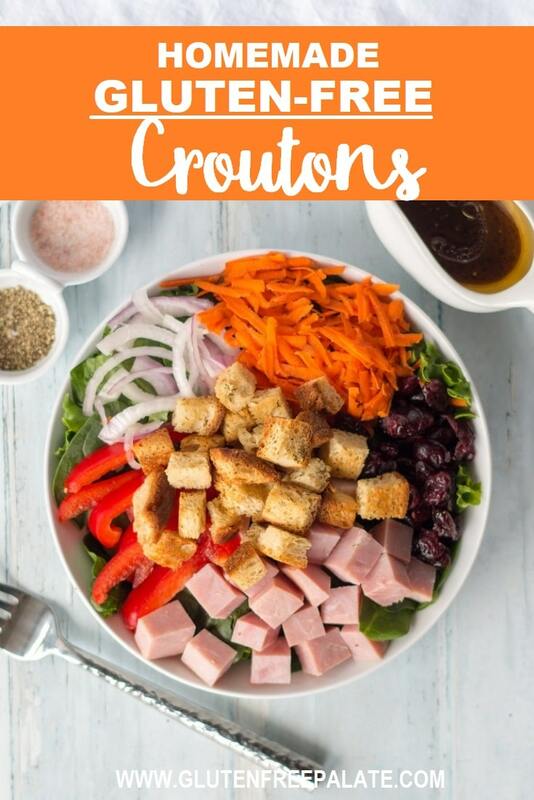 If you’re a salad lover, and you like a little crunch in your salad, you are going to LOVE these Gluten-Free Croutons. They are super crunchy and have the perfect amount of garlic and dill seasoning. This recipe post is sponsored by Canyon Bakehouse. Opinions are my own. 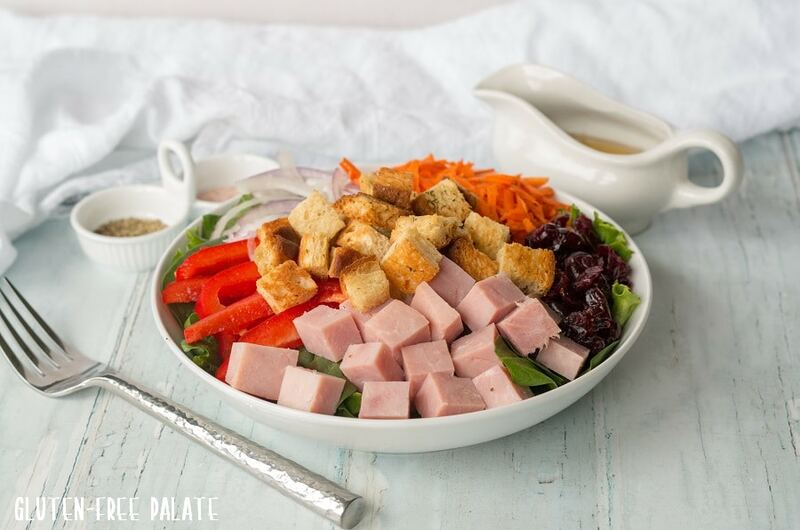 Did you know that gluten-free croutons are SUPER easy to make? 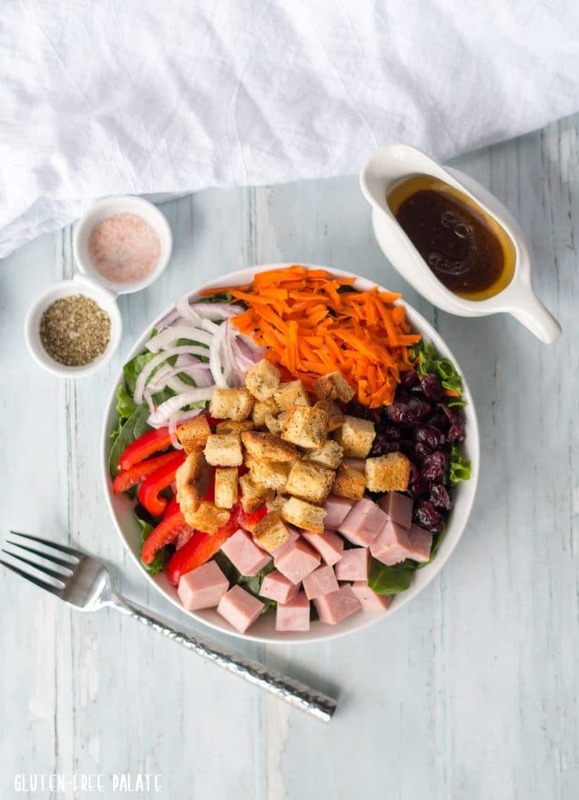 This Gluten-Free Croutons recipe was inspired by my sister, and will wow you from the first bite. My sister used to be a chef. She went to culinary school and cooked on some of the best culinary teams in the North West. She loves mixing flavors (and so do I). One of my favorite combinations of flavors is garlic and dill. It’s one of her favorite combinations too. You can make gluten-free croutons form fresh or stale bread. I use both, depending on what I have on hand. She and I like “most” of the same foods, and when she heard about these Gluten-Free Garlic Dill Croutons, she was practically begging for the recipe. I used Canyon Bakehouse Heritage Style Honey White in this recipe. The texture is PERFECT for making these Gluten-Free Garlic Dill Croutons. And because Canyon Bakehouse breads are gluten-free and dairy-free, I was able to keep these Gluten-Free Garlic Dill Croutons free from both. In a large mixing bowl, toss oil and bread cubes. Spread bread cubes onto two large baking sheets (or three depending on the size of your baking sheets). Sprinkle dill and garlic salt evenly over the bread cubes. Bake for 8-10 minutes, stir with a spatula, and bake an additional 8-10 minutes, or until golden brown and crunchy. Again, you can use fresh or stale bread to make gluten-free croutons. It doens’t make a huge difference in this gluten-free crouton recipe. My sister and I love to share recipes, and we love catching up over a good meal (see how the word LOVE is a theme in this post, you’ll see why below). Canyon Bakehouse just launched a Reunite with Bread campaign where they are sharing the loaf (err, I mean, love) with people across the nation. This promotion is over, but keep an eye out for future promotions. 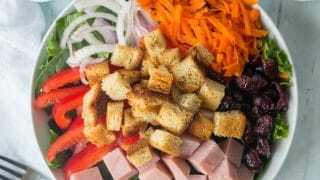 Can I use other gluten-free bread to make croutons? Yes. 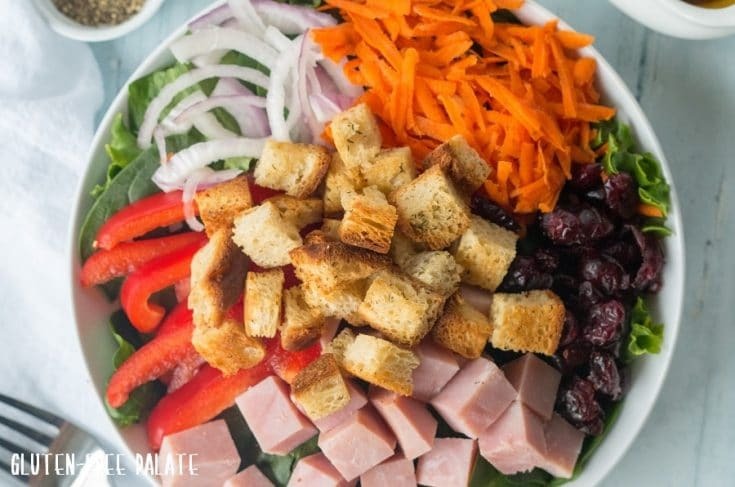 You can use your favorite kind of gluten-free bread to make gluten-free croutons. Just use the same amount called for in the recipe. I also like using the Canyon Bakehouse 7 grain bread in this recipe. How long can I store gluten-free croutons? You can store these homemade gluten-free croutons in zip-lock bags or an airtight container at room temperature for up to three days or in the freezer for several weeks. Just note that they may loose some of their crunchy texture if you store them in the freezer. If you freeze them, reheat them in the oven for 10 minutes to drive any moisture out. I am so excited to partner with Canyon Bakehouse on this campaign. I love that they are sharing their amazing products with everyone. Canyon makes some of our favorite products and they are available nationwide. If you make these gluten-free croutons, please stop back by and let me know what you thought and which bread you used. Also, if you have any questions please leave a comment below and I will get back to you. Crunchy gluten-free croutons that are perfect as a topper to any soup or salad. This the best bread ever! I love enjoying bread as cinnamon toast! And i love brown sugar cream cheese on bagels! “Leave a comment below telling me your favorite way to enjoy bread or bagels.” Hm. There’s no improving on butter. Although I do like cream cheese on a bagel. And I do like flavored cream cheeses. And how about some sundried tomato bagels? My favorite way to enjoy bread or bagels is just toasted with butter.